Busy Bags are simple and engaging learning activities that young children can do on their own. All of the materials for the activity are stored in a plastic bag or pencil pouch so they are easy to take on-the-go. 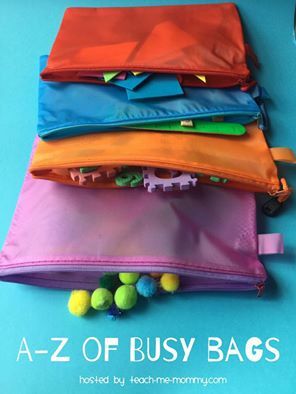 Busy bags are perfect for toddlers or preschooler when you are waiting in a doctor’s office, going out to eat in a restaurant, traveling in a car, or cooking dinner. 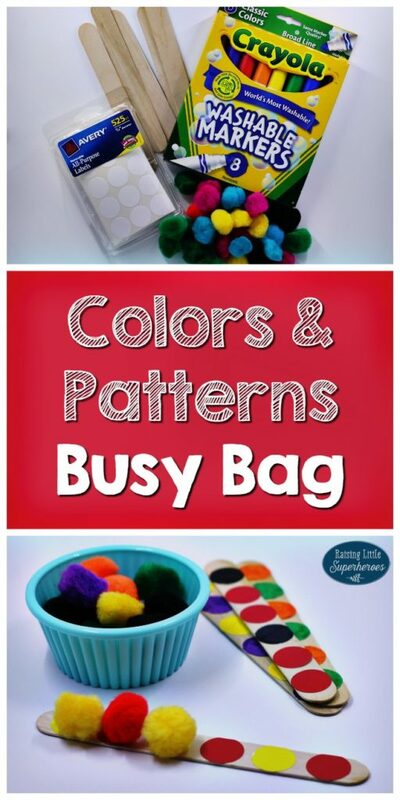 For this Colors and Patterns Busy Bag, children will practice identifying colors and creating patterns using simple materials that can easily be taken anywhere you go. Place the pom pom on top of the dot stickers to match the colors and create the pattern. Let your child color the dot stickers and place them on the popsicle sticks to create his or her own patterns. Have your child pick up the pom poms with tongs and place them on them on the popsicle sticks to develop fine motor skills. For More Busy Bag Ideas, Check Out The A-Z of Busy Bags! How clever! Thanks for participating in the series!